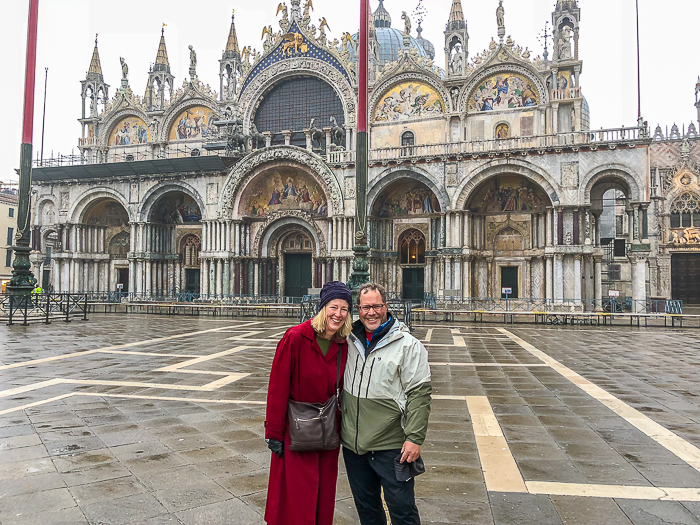 At San Marco – the rain has chased the crowds away! 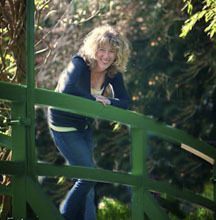 We’ve been here once before, several years ago, one of our first forays into our Artist James Art & History tours. 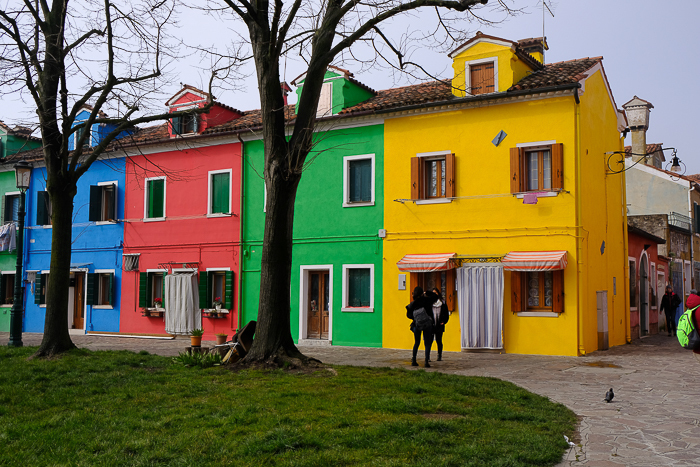 Whenever we’d discussed places we’d like to re-visit, Venice usually came up last on my list. “Too much water,” I’d say. Those of you who know me well understand my concerns. An accidental viewing of a video containing swells at sea is enough to churn my stomach. Venice, of course, is all about the sea, the water, the churning. James, however, continually ranked Venice high on his return list. How could it not, as an artist? And besides, the subject reliably delivers at the gallery--all those Oregonians who’ve dropped into Saint Mark’s Square during a cruise on the rolling waves appreciate a visual reminder of their travels by a local artist. I found it hard to say no anymore. My concession, however, would be small splurge of an apartment where I could recover and pretend we weren’t situated atop thousands of wooden stakes hammered down 15 feet into a lagoon, a place where I could NOT see any canals. I found such an apartment on TripAdvisor, a spacious belle just off the Saint Mark’s side of the Rialto Bridge. She looked perfect. Like many beauties, she comes with some issues. Lack of heat, for one. While not fluent in Celsius as far as comfortable room temperatures, I knew we had a problem when Jim offered me his down vest to wear over my pajamas. (Very chivalrous, my guy!) Those up and down arrows on the thermostat did nothing, but thankfully, a call to the manager did. 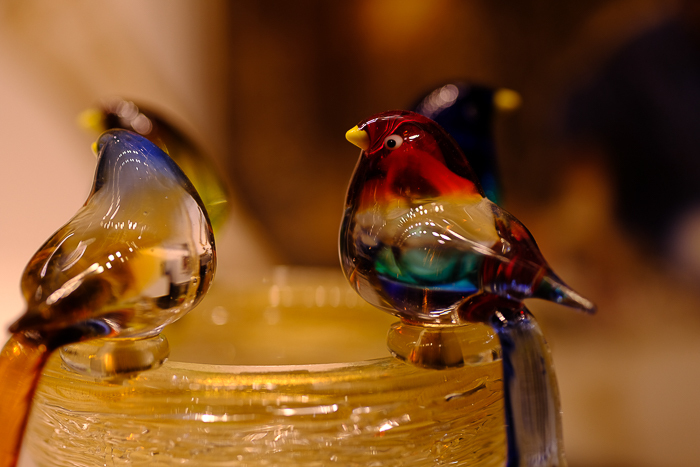 We were helpless, however, about the flow, or lack of flow, of water inside the apartment. Up on the 4th floor of a who-knows-how-old building, we really couldn’t expect more, we figured. Jim can nearly complete his nap in the amount of time it takes to fill his bath. As for the shower, thank goodness we have a decent hot water heater, because that trickle takes forever to get the job done. Funny thing about our sci-fi-looking shower, with its countless jet options to spray you from multiple angles, a built-in radio, an alarm... In truth, the radio delivers static, and we don’t dare attempt the alternative jets; they’d feel more like soggy sneezes over the body. Unhealthy curiosity caused me to push the alarm button, which had the nifty effect of briefly releasing me from jet-lag. Still, it’s all so very pretty. Impractical, but pretty. 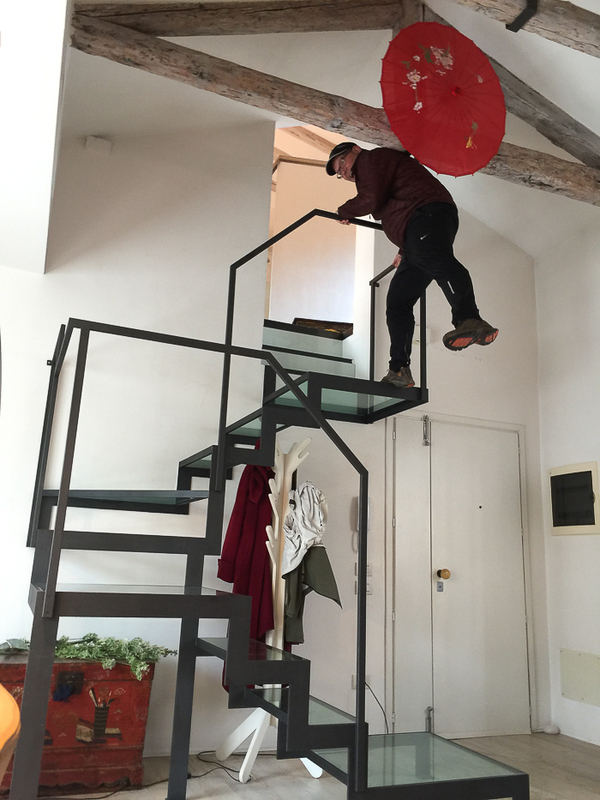 Just like the glass stairs inside our apartment. Yes, glass stairs. Ah, who needs safety rails? This sparkly wonder ascends to our upper loft den, an open space with a small bathroom obscured only by a half wall--made of frosted glass, of course. Better be extra-specially familiar any travel companions staying up there, because you hear EVERYTHING. There are no doors there. To anything. To climb to our apartment itself requires four flights of stairs and three keys. One for the outer door, one for our apartment door, and one for our own elaborate metal gate just before our top-floor apartment. You need a key to not just enter this gate, but to exit it. I don’t think the architectural designers had fire safety as a primary concern. On the other hand, the artistic designers of the apartment were Italian masters of our modern day. This is perhaps the most stylish place I’ve ever stayed. Not my top personal taste, but I admire the success with which they pulled off the Asian decor here. In the end, we’ve grown to love our apartment. Like Venice, she’s a temperamental vision that requires adaptation in order to fully appreciate her charms. Whether intending to or not, we often adopt a thesis for our overseas journeys. During our first trip to Italy, it was all-things Michelangelo. During our stay in the Tuscan countryside, it was Saint Francis. While in Spain, it was testy rule-enforcing middle-aged women. We keep an eye out for such themes as we travel. On this journey, we hunt for mosaics. Mosaics first caught our attention in Istanbul, a city at the literal crossroads of Europe and Asia. Istanbul’s Hagia Sophia Church, a wonder in its architecture alone, boasts 1,500 year old mosaics. 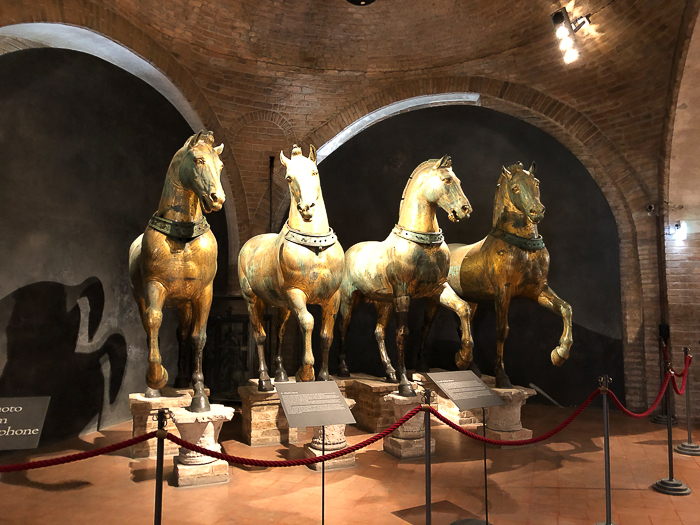 Islamists plastered over these Christian treasures (too many graven images) when they besieged the city in 1453. Historians eventually re-discovered the mosaics, nicely-preserved thanks to their glassy durability. 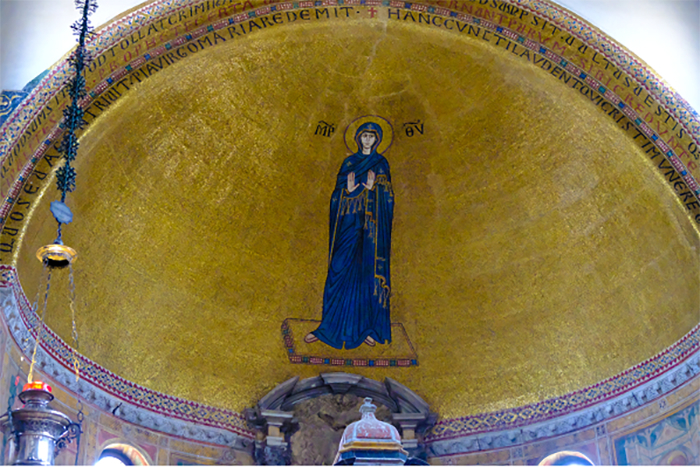 Venice’s Saint Mark’s Basilica is an Hagia Sophia that never got highjacked. Mosaics coat the floor, walls and ceiling. The average mosaic creator remains anonymous; who knows exactly who attached these millions of finger-nail-sized pieces of colored glass? From 11:30-12:30 each day, the lights inside Saint Mark’s spotlight the mosaic ceiling, creating a roar of golden sparkle, a roar louder than the vast groups of Japanese tourists on parade below. 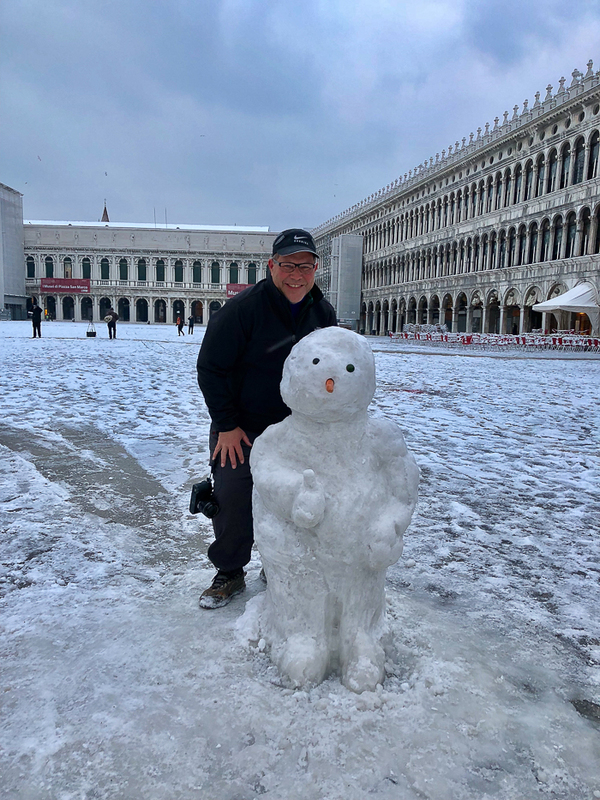 In the days leading up to this trip, Jim monitored the weather forecast for Venice, concerned by reports of rain, ice and snow. We prepared adequately gear-wise. Sure enough, early our first morning here, my jet-lagged self noticed that familiar bright twinge through our windows: three inches of snow had fallen during the night. 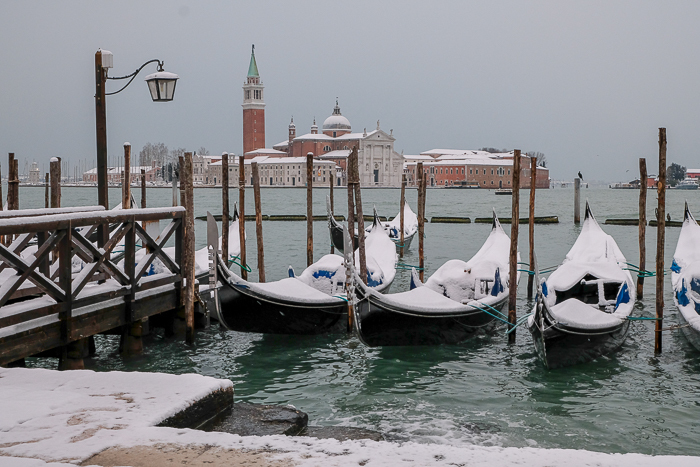 Venice is well-equipped for flooding, but not for snow and ice. Marble plazas and tiny canal bridges don’t play well with it. But, my, the camera loves it. Jim ventured out to Saint Mark’s Square before most Venetians knew what had hit them, catching the iconic views, void of visitors, in a unique perspective of white purity. While I prepare our trips with careful detail, our plans stay flexible, and that proved helpful in our adaptation to the snow. Instead of starting with Rick Steves’s walking tours, we explored indoor museums our first two days, traveling there by vaporetto water bus. 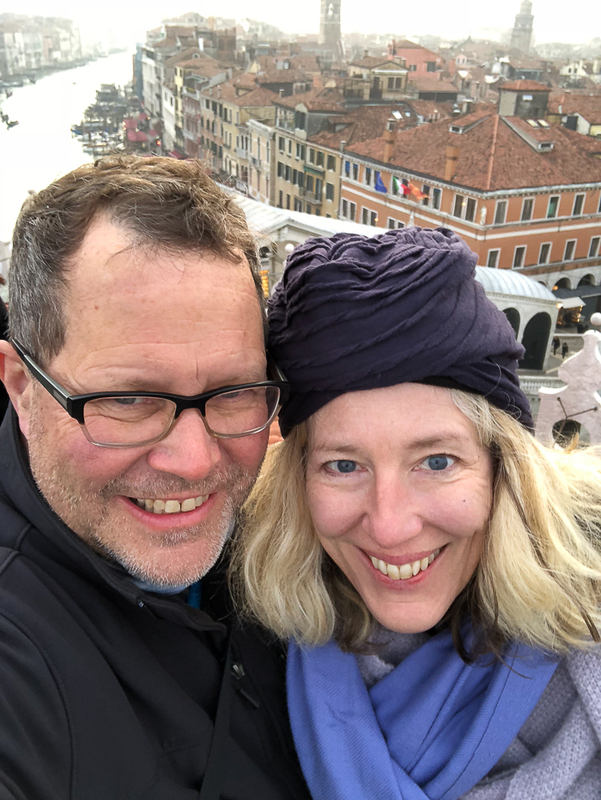 As the temperature slowly rose, we resumed our walking, finding it much easier to log 13.3 miles and climb 34 flights of stairs (think canal bridges) in one day than it had been to negotiate a few slippery surfaces the previous day. 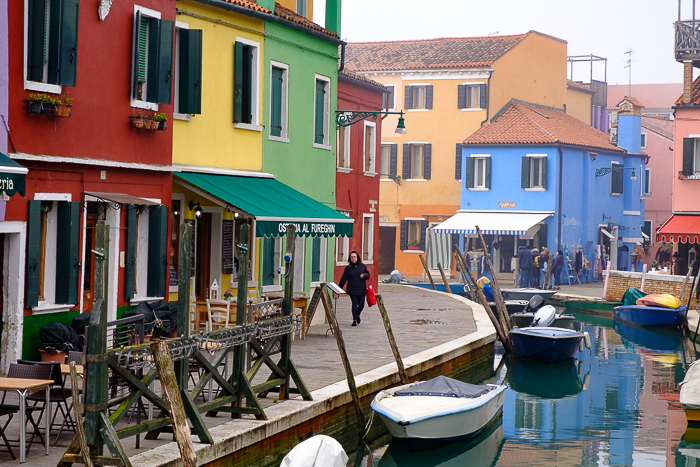 Getting around Venice requires first and foremost an acceptance that you’ll get lost. Remembering that you’re on an island and can get only-so-lost is reassuring. Google maps also helps, an aid we resort to only in the most dire of disorientation circumstances, such as when the maze of minuscule streets proves too tiny for inclusion on our paper maps. Navigation by foot in Venice reminds me of those grade-school maze puzzles where you begin at one end and work your way by pencil to the other end. As I often did with those puzzles, I’d plot our path from both directions; I’d start at our destination and move backwards. Since the Rialto is such a central location in Venice, vaporetti stopping here often arrive packed beyond comprehension, particularly during rush hours when workers commute to their mainland homes. Jim and I watch with pick-pocket-trembling at arriving boats, wondering how we might ever join the packed pack. Thankfully, almost all the arrivals exit first. They come, and come, and come. How can these hundreds of people fit inside these boats with about 80 seats inside? “Clown car” I whisper to Jim as we monitor the flow of incomers to Rialto. He laughs. If only we could get such a healthy flow with our apartment water pressure. Over time I embrace the vaporetto for its functionality and protection: it keep us from slipping and falling in the ice, suffering broken bones, and having to ride a water ambulance to Venice’s hospital. Eventually I move beyond the vaporetto to the traghetto (a gondola taxi) which crosses the Grand Canal at underserved bridge areas. 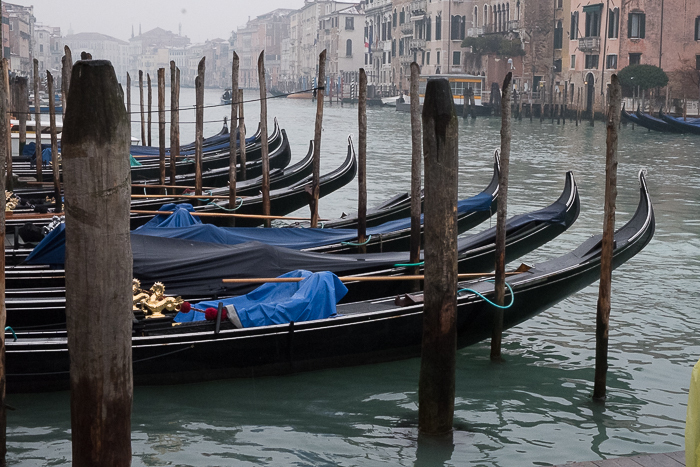 Gondola drivers, who normally haul in about $100 per ride, have to take turns at traghetto duty each month. Our cost? About two dollars--a poor-man’s gondola ride. We learn and adjust and enjoy, but I think I’ll be ready to leave all this water behind and make our way for dryer themes on solid land.